La bière de Noël est le fruit d’une tradition brassicole vieille de plusieurs siècles. Issue des dernières récoltes d’orges, cette bière, autrefois dite "d’octobre", bénéficiait des températures plus fraîches de l’automne et pouvait mûrir tranquillement pendant plusieurs semaines. "Nedeleg laouen" (joyeux Noël en breton) est une bière rousse pur malt, atypique et généreuse, plus forte et épicée. Pours amber with medium white head. Nose is fruity and spicy. Aromas are sweet malts, caramel, fruits, spices and candi. Average carbonation, full body. Long sweet and spicy finish. Bottle. Hazy amber color, with orange reflex; generous head, creamy. Mild aroma of malt, bread, vegetables, spices, hazelnuts. Good body strength, but in the front there is a dusty bread flavor, followed by sweetish malt and vegetables, sweet nuts. Low bitterness. Not bad, but not impressed. Bottle from La Trinitaine, Dinard, Brittany, France. Hazy dark red-brown coloured with spicy red fruit and malty flavours, chocolate, vanilla oak and whisky notes on the finish. 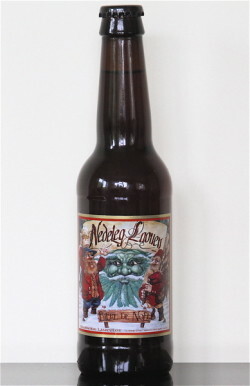 Une bière de Noël (nedeleg laouen = joyeux Noël en breton) plutôt bonne, belle rondeur. Un poil lourde sur la longueur. Bouteille achetée chez La Trinitaine, chaîne de produits bretons, Sarzeau, France, bue courant août 2014. Pours amber with tan head which quickly receeds. Smell is cherries, toffee, brown sugar, some spice and the alcohol is certainly present. Taste is medium sweet offset by light bitter and medium sharp sour which is balanced quite nicely. A tad watery in the mouth but overall pretty decent! Pours a cloudy amber with full tan head. Aroma of cherries and toffee. Taste is sweet with a sour aftertaste. Palate is sharp with a little oily texture. Overall it is an interesting winter beer. Bottle 33cl, a cloudy amber beer with medium head. Nose is spicy, very yeast like with kind of grapefruit and over ripped mandarin orange touch. Aroma is on spices such a cinnamon, cloves, old yeast, a rather rough work. Bought from a shop in Rue du Fil, Pontivy, Bretagne which sold beer, whisky and all sorts of odds & ends. Muddy brown-red, quickly diminishing head, spice with a little sourness, yeasty. Alcohol prevalent, unsubtle with pretensions of a Belgian ale. Happy Christmas in Gaelic.